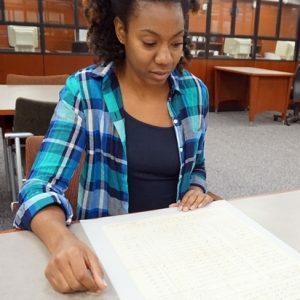 Valencia McMillan, an MPA graduate student in Forensic Accounting, examines a 200-year old invoice for the care of enslaved children, in the records of the Comptroller’s Office at the NY State Archive. This project is supported by the Master of Public Administration Programs at John Jay College of Criminal Justice, CUNY. The following are the faculty members and students involved. For each student we have identified a research focus. Julius Caranda – Street directory addresses for NYC slave holders.